The LEVO G2 Essential Tablet Stand with USB Charging is an adjustable iPad, tablet and eReader stand which allows users to sit, lay back, or lie in bed while securely using their tablet or eReader without having to use their hands. A high-quality USB passthrough cable allows the tablet to charge (requires USB power source connected to the cable at the base). The rigid sturdy design and weighted base minimize bouncing and greatly reduce the risk of tipping, ensuring uninterrupted viewing comfort. The LEVO G2 Essential has convenient features including quick-lever height adjustment locks, 4-axis swing arm with micro-adjustments to fine tune the positioning of the tablet and adjustable tension in each movement. The user can also interchange platforms from tablets and eReaders to books - and back again (book platform sold separately as accessory). The holder accommodates tablets and eReaders up to 8.7" x 12" with a weight up to 4 pounds. Height range of movement is from 26" to 43" (measured from floor to center of tablet platform). The sharp Black finish blends well into most home environments. The Levo G2 Essential Tablet Holder is ideal for users reading while sitting or surfing the web in bed. If the application is primarily an office setting over a desktop, consider the LEVO G2 Deluxe Table Clamp Stand for iPads, Tablets, and eReaders as an alternative. 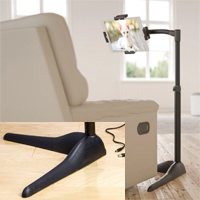 If there is a desire for increased stability, easy mobility, and greater reach the LEVO G2 Deluxe Floor Stand for iPads, Tablets and eReaders is the practical choice. Reduces Strain and Fatigue - The design of the G2 Essential allows the user to sit or lie comfortably in the most comfortable position. This eliminates hunching and will reduce strain in the back, neck, shoulders, and arms. Hands Free - No Need to Grip - The G2 Essential is able to hold most tablets firmly in place allowing both viewing and using the touch surface of the tablet to type, access information, surf the web, etc. Normally using a tablet requires the user to exert constant grip force to hold it securely while typing and using the touch surface. The Essential gives users a second set of hands, freeing both their hands for not only using the tablet, but other activities as well. Increases Overall Comfort - The versatile movements of the G2 Essential allow users to avoid any awkward positions. It also makes it possible for the user to choose the most comfortable posture. Effortless Storability - The user can easily move the G2 Essential arm out of the way when temporarily leaving their G2 tablet viewing setup, and quickly reproduce the position they were in upon their return as the tablet height and orientation are not impacted by the lateral arm movement. 4 Axis Articulating Swing Arm: This allows the user to place their tablet in the most comfortable, ergonomic reading position. This reduces awkward positions, tired arms, and neck pain while reading. Compatible With Most Tablets: Supports tablets and eReaders up to 8.7 x 12 inches and weighing up to 4 pounds. 360° Easel Rotation: Easel can easily spin between portrait and landscape orientation, making the LEVO G2 Essential Tablet Stand as suitable for viewing movies as for reading. Convenient Charging Extension: The LEVO G2 Essential Tablet Stand with USB Charging features an integrated USB extension which eliminates cord clutter and reduces the risk of accidentally catching a cord and tipping the sand. The charging extension extends up through the vertical support column and provides a charging port directly adjacent to the table head. Standard charging cords can be plugged directly into the base of the G2. Lightweight Design for Portability: The low weight of the LEVO G2 Essential Tablet Stand—just 8 lbs—means it can easily be moved between locations. Weighted Base for Stability: LEVO G2 Essential Stands have a weighted base which ensures that devices are safely supported. Slim Base: The right-angle legs are designed to tuck in close to the corner of a chair or sofa. This eliminates the risk of tripping over a base which projects further out into the room. No Clearance Required: The right angle base and cantilever design of the arm means that it does not require any clearance under furniture. However, if sufficient clearance is available the base can also be positioned with the legs below a chair or sofa, further increasing stability and offering additional positioning options. Can Be Used Lying Down: The LEVO G2 Essential is able to hold tablets in an inverted position which allows the user to read lying in bed. Height Range: Range of movement is between 26" and 43" (measured from floor to center of device). Set your LEVO G2 Essential Tablet Stand to a height which eliminates a bent neck (either up or down). This will reduce the risk of tension developing in your neck while viewing your tablet. When using your LEVO G2 Essential Tablet Stand ensure that you position it to reduce or eliminate glare from lighting or windows.